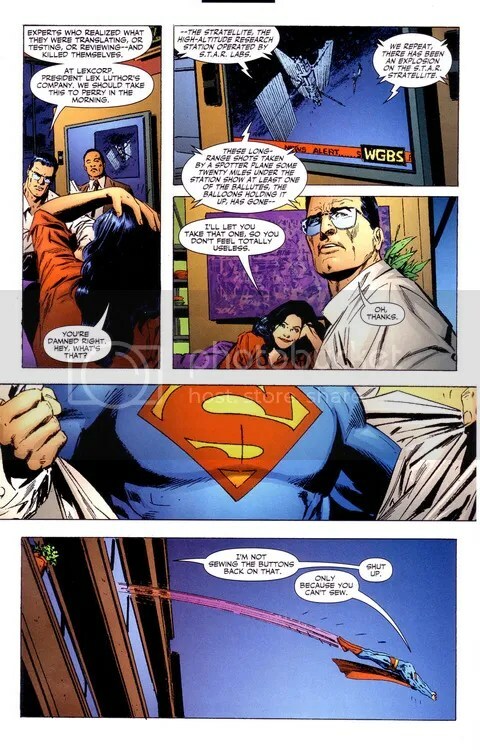 Clark Kent is one of my patron saints. The quarterback-sized reporter with the calm manner and the dogged refusal to back down from a story is an ideal I find very attractive, arguably far more than the whole blue suit/cape/superpowers thing. Clark’s a working journalist, a journeyman reporter. He’s Cary Grant in a good hat with a press pass, a calm, solid guy who can’t not write and can’t stop once a story presents itself. As ideals go, that’s a pretty good one to aspire to for me. The Rosalind Russell of the DC universe, a reporter whose cheerful disregard for politeness, official whitewashes or the word ‘no’ frequently gets her into as much trouble as it does success. She’s relentless, a force of nature who absolutely will not back down, stares every single fight right in the eye and delights in not only being the best reporter in the city, but good naturedly messing with her farmboy partner. Lois is an original, an American classic, one of the greatest comic characters of all time. 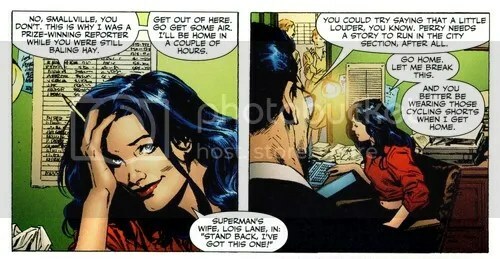 Of course, so is Clark but just like Ginger Rogers, Lois has been around for as long as he has and does what he does, just frequently in heels, backwards and with no superpowers. Which means she just has more of an excuse to mess with him. Those two reporters; the good-natured, polite farm boy and the spitfire city girl are one of the most endearing pairings in modern fiction. They’re also one of the most consistently well cast; look at Christopher Reeve and Margot Kidder in the Donner-era Superman movies, Dean Cain and Teri Hatcher in Lois and Clark: The New Adventures of Superman (Note the title there too) and Tom Welling and Erica Durance, who didn’t so much attack the role as beat it senseless and make it her own, in Smallville. There’s a reason these two have been around for 75 years, they’re easy to admire, to aspire to, easy to love. That’s been helped immensely, on the big screen, by the music associated with them. The Donner-era Superman theme is one of the finest pieces of movie scoring ever produced. It’s iconic and majestic in a way which manages not to be pompous. The slow opening refrain is a statement of intent and the constant, driving line beneath it, the light twin of Williams’ own Jaws theme, start to raise your pulse almost before you know it’s there. There’s real excitement to this piece of music, a sense of something amazing about to happen and when it does explode, spreading out into that wonderful, expansive brass line it becomes one of the most unabashedly heroic pieces of cinema music of the last few decades. What makes it great though, is the tempo. There’s something almost boyish about the speed the piece cracks along at, Clark’s country boy innocence and open good nature translated into music that revels in its patterns and shape. Played right, it’s a piece that seems genuinely excited to be heard and there are two spots in there where you can almost hear it rally, take a breath and speed up again. Bravery and hard work, tenacity and compassion all wrapped around that central, bustling refrain. And at the heart of it is Lois. The theme for their relationship only shows up once but it’s almost dead centre in the piece of music, keeping pace with the other refrain but still an individual, still marking its own time, working its own angles on the story. Williams is one of a small, elite body of composers whose work has scored the largest, and some of the best loved, movies of the last few decades. His Superman theme is undoubtedly amongst his best work but that also makes it unassailable to the point that Bryan Singer’s 2006 Superman Returns opted to simply reprise Williams’ theme rather than have a new theme composed. Whilst this was absolutely in keeping with Singer’s movie, itself an extended love letter to the Donner-era, it ultimately helped mute an already uncertain film. Superman Returns has a lot to recommend it, not the least of which is Brandon Routh in the lead role and Kevin Spacey as Lex Luthor but it struggles to find a voice of its own and, for me, remains an interesting failure. So, with all the hopes for a new DC movie franchise resting on Man of Steel, the new Zack Snyder-direted picture, the question of how to score the film rose up once again. Snyder opted, sensibly, for Hans Zimmer. Zimmer is arguably the Williams of this generation, a man whose iconic, and at times daring, work has scored everything from Crimson Tide through to, appropriately, the Christopher Nolan-directed Batman trilogy. Zimmer’s work is as iconic, as extraordinary, as Williams’ and earlier this week we got our first run at it. Now back to work, we’re on deadline. Images taken from JLA Classified: New Maps of Hell, written by Warren Ellis with art by Butch Guice which is available here. Click here for The John Williams Web Pages, an archive of information about his work. Click here for Hans Zimmer’s webpage.